View of Kalaupapa National National Historical Park. The most famous of all Molokai parks is the Kalaupapa National Historical Park. Located on a remote peninsula, the National Park Service has managed Kalaupapa since 1980. Kalaupapa once served as Hawaii’s colony for thousands of quarantined patients afflicted with leprosy. This once incurable disease is now called Hansen’s disease. The National Park Service seeks to preserve and interpret the history of those who were exiled here. The park does not have opening or closing hours. It remains a community of patients that once had Hansen’s disease in Hawaii. All visitors, regardless of how they enter the park, must be 16 years or older. Visitors must obtain permits to enter the park. Tourists can arrive by plane, boat or by mule on a narrow path down the cliffs. The ocean surrounds the Kalaupapa Peninsula on three sides. The world’s tallest sea cliffs borders it on its fourth. There are no restaurants, shops or stop-lights. Provisions arrive weekly for the residents, giving no need for a general store. Here, there are only homes, gardens, churches, graveyards and its quiet gentle inhabitants. King Kamehameha V established the Act to Prevent Leprosy in 1865. As a result of this law, anyone living in Hawaii with the disease was exiled to Kalaupapa. This law continued for 103 years until 1969. In all, the Hawaiian government quarantined over 8,000 patients to Kalaupapa. The current residents of the community are eye-witnesses to what life in the colony was like. Several of the patients have been here since they were 12 years old. Sadly, many feel like outcasts of society. As a result, they are not comfortable living in the outside world. Because of this, they choose to remain on Kalaupapa. Visitors can gain insight into the sacrifice and sorrow of those still living in this community. Additionally, Kalaupapa has been the home of religious legends, Father Damien and Mother Marianne Cope. Father Damien dedicated and eventually gave his life to serving the people in Kalaupapa during the late 19th century. Mother Marianne Cope selflessly brought joy and hope to those suffering in the colony. Visitors can experience some of this painful past. Most tourists visit this park by taking the mule ride down to Kalaupapa. Such rides are offered through Damien Tours, a private company that gives guided tours to the historic town. Physically fit tourists can also walk down the cliff path to Kalaupapa. However, it is a difficult hike of 3.5 miles requiring a high level of fitness. Camping is not permitted in the community itself. However, there are camp grounds some 1,600 feet above the peninsula. This camping area, located in Pala’au State Park, allows for guests to stay in a wooded space above Kalaupapa. All visitors to Kalaupapa Peninsula must behave respectfully and graciously to the patient-residents there. Taking photographs of the inhabitants or their homes is not permitted without written permission. There is no place to purchase food and water in this park. So visitors must bring their own. Trail at Pala’au State Park, one of two Molokai Parks. Pala’au State Park is located in the mountains north of Kualapu’u at the end of Kalae Highway. 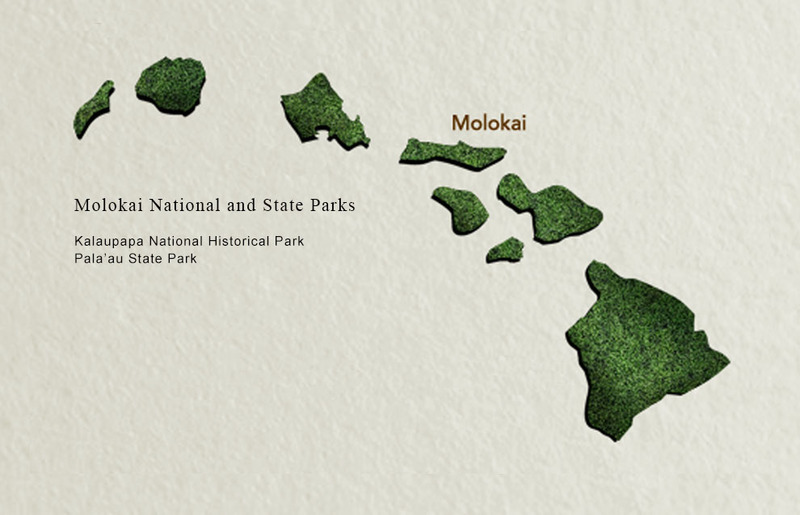 This is only state park on the island and the second of two Molokai parks. But it is one of the most popular places to visit on the island. It’s open daily to the public. While there are no entrance fees, donations are accepted. The park stretches over 233 acres. Here, you can view stunning landscapes of pastures and forests of eucalyptus and koa trees. 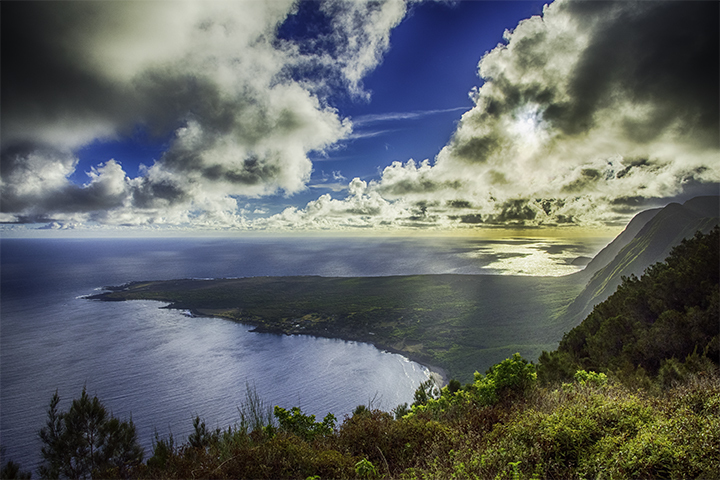 It also offers stunning panoramas of sea cliffs and the famous Kalaupapa National Historical Park below. The terrain varies from dense forests to rocky trails and features hillsides filled with lush vegetation. From the park’s heights of 1,600 feet hikers can observe a panoramic view of Kaluapapa National Historical Park. This is where Father Damien, a venerated saint, once cared for hundreds of people suffering from Hansen’s disease. It is a reminder of the great heroism of Father Damien and others who ministered to those confined to this colony. Also in the state park, there is a monument called Phallic Rock. It represents the legend of the fertility god Nanahoa. He turned into stone after pushing his wife over a cliff during an argument. Women once believed they would become fertile if they slept near the stone. Visitors are asked to remain respectful to this historical area. 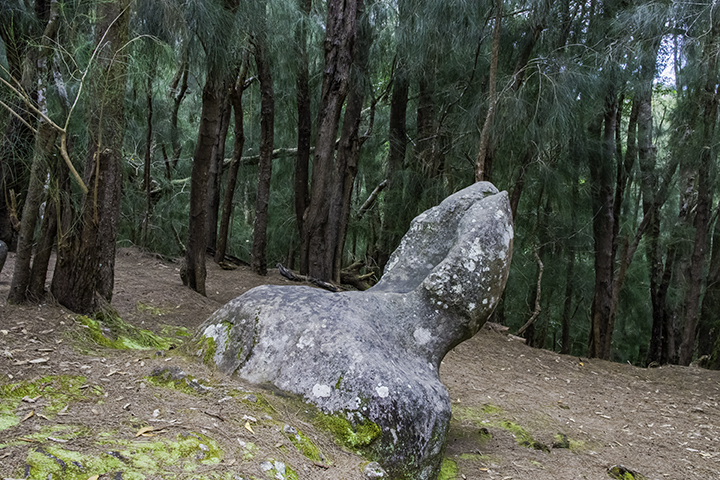 Hikers can explore trails around the park, going up to Kalaupapa Lookout. 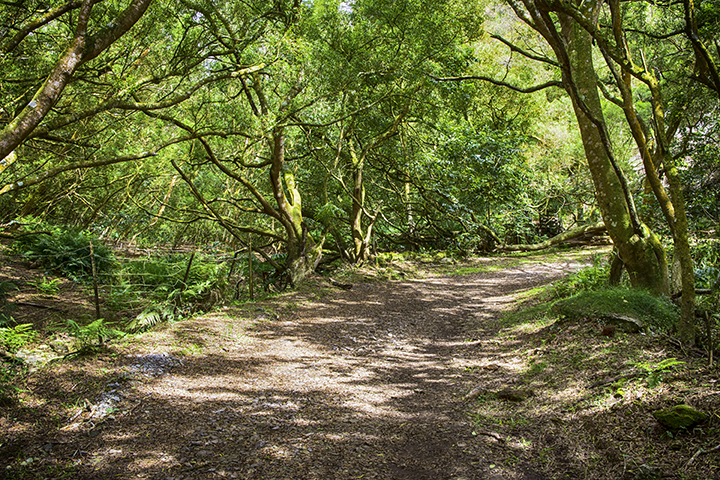 Here they can find picturesque views, and wander through the ironwood forests. Here, you can also experience the famous Molokai mule rides on the highest sea cliffs in the world. All travelers to the park can enjoy the picnic areas, restrooms, paved parking, hiking trails, historical sites and camping areas. You need a permit to camp costing $5 a day for each campsite. The park is open 24 hours a day. There are no showers or drinking water at the campsites. So be sure to come prepared. Here, the weather can be cool and wet. So hikers and campers should be prepared for such weather conditions.